BACKGROUND: Recently published prospective clinical trials and two meta-analyses have shown that addition of induction chemotherapy (IC) to concurrent chemoradiation (CRT) could potentially improve outcomes in comparison to CRT alone, in locoregionally advanced nasopharyngeal carcinoma (LANPC). Although it remains unclear which is the best IC regimen to be offered and for how many cycles. Unfortunately, till date, there are no published data from India regarding the outcomes of various commonly used IC regimens before CRT, in LANPC. MATERIALS AND METHODS: Patients diagnosed with LANPC from January 2012 to December 2017, who received three cycles of IC before definitive CRT were reviewed retrospectively. Patients' profile, toxicity of IC, response rates, failure-free survival, and overall survival (OS) were evaluated. RESULTS: A total 34 patients with LANPC who received IC were reviewed. The median age at diagnosis was 36 years, and the majority were males (67.6%, n = 23). Nineteen patients received IC with paclitaxel plus cisplatin regimen (TP) and the remaining 15 patients received IC with docetaxel/paclitaxel plus cisplatin plus 5-FU regimen (TPF). The overall response rates after three cycles of TP and TPF IC were 68.4% and 80%, respectively, and the corresponding rates were 84.2%and 93.3%, respectively, 2 months after completion of CRT. 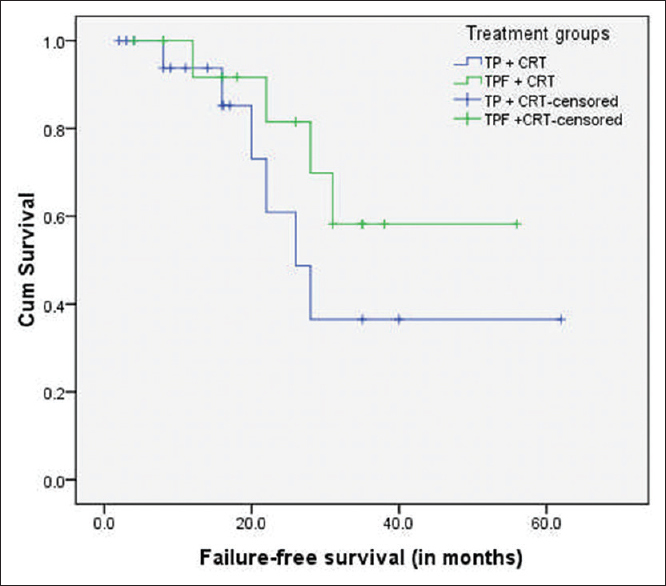 At a median follow-up of 24 months, 2-year failure-free survival and OS for TP arm were 78.9% and 89.5%, and the corresponding rates for TPF arm were 86.7% and 93.3%, respectively. All Grade III–IV toxicities were numerically higher with triplet IC regimen in comparison to doublet regimen. CONCLUSION: In this retrospective analysis, there was no significant difference between taxane-based doublet and triplet IC regimens, in terms of survival outcomes, although Grade III–IV toxicities were numerically higher with triplet IC regimen. Clearly, these hypothesis-generating findings should be tested in a prospective randomized setting. 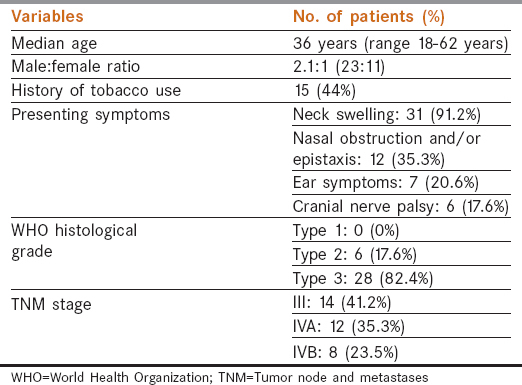 In comparison to other head–neck malignancies, nasopharyngeal carcinoma (NPC) is unique in terms of epidemiology, etiology, clinical presentation, treatment strategies, and response to therapy. It has a well-defined racial and geographic distribution. South-East Asia, Southern China, North Africa, and Alaska fall under the endemic zone; on the other hand, in spite of high incidence of other head–neck cancers, India falls in the non-endemic zone for NPC, except some North East regions of our country. Due to its anatomical location and nonspecific symptoms, early detection of NPC is a major challenge and 60%–70% of patients present with locally advanced disease. 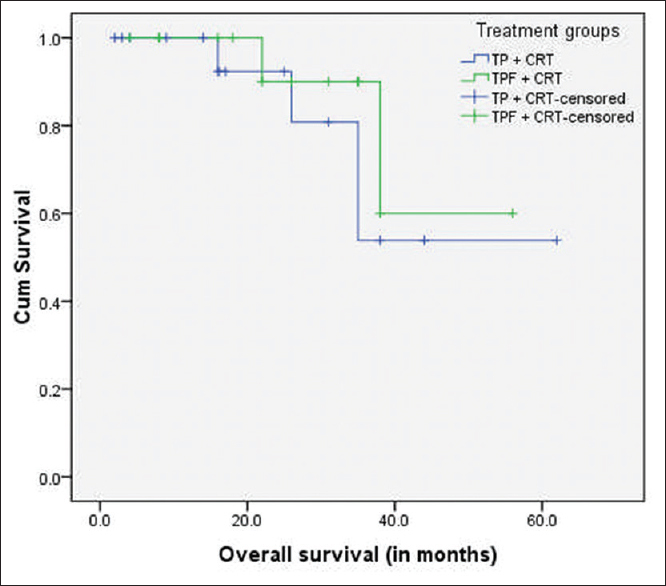 The current standard of care for locoregionally advanced nasopharyngeal carcinoma (LANPC) is concurrent chemoradiation (CRT)., Unfortunately, ≥20% patients with LANPC still experience distant failure after definitive CRT.,, Therefore, quite conspicuously there is an urgent need for exploration of other modalities of treatment intensification with curative intent, for this potentially curable malignancy. Addition of induction chemotherapy (IC) before definitive CRT seems to be a potential strategy. Recently published prospective clinical trials and an individual patient data meta-analysis have shown that addition of IC to CRT backbone could potentially improve oncological outcomes in comparison to CRT alone, in patients with LANPC.,, Similar findings were reported in another systematic review and meta-analysis of comparative studies. Although it remains unclear which is the best IC regimen to be offered and for how many cycles. Unfortunately till date, there are no published data from India, regarding the outcomes of various commonly used IC regimens before CRT, in patients with LANPC. All consecutive cases diagnosed with LANPC, having Eastern Cooperative Oncology Group (ECOG) performance score ≤2, and who received three cycles of IC before definitive CRT at our institute between January 2012 and December 2017 were investigated retrospectively. All the patients underwent a detailed history and physical examination, including nasopharyngoscopy. The locoregional disease extent was investigated by contrast-enhanced computed tomography (CECT) or magnetic resonance imaging (MRI) scans, and diagnosis was confirmed by microscopic examination of biopsy specimens. Histological typing of the tumors was done according to World Health Organization (WHO) criteria. CECT scan of the thorax/abdomen and bone scan were done in all patients, to exclude metastatic disease at baseline. Patients received three cycles of IC with either a triplet regimen of docetaxel 75 mg/m2 on day 1, cisplatin 75 mg/m2 on day 1, and 5-FU 750 mg/m2/day on days 1–5 (TPF regimen) or a doublet combination of paclitaxel 175 mg/m2 (or docetaxel 75 mg/m2) on day 1 and cisplatin 75 mg/m2 on day 1 (TP regimen). The decision regarding choice of IC regimens was at the discretion of treating physician. Primary granulocyte colony-stimulating factor (G-CSF) prophylaxis was given to all patients. A 25% dose reduction in subsequent cycles was done in patients developing any Grade IV or life-threatening toxicity. After completion of three cycles of IC, patients were planned for definitive CRT. External beam radiotherapy (EBRT) was given at a dose of 66–70 Gy at 2 Gy/day fraction over 7 weeks by 4–6 MV photons to nasopharynx, parapharyngeal areas, posterior part of nasal cavity, basiocciput, base of skull, pterygoid fossa, posterior third of the maxillary sinuses, lateral and posterior pharyngeal walls, retropharyngeal, and cervical lymph nodes; either by three-dimensional conformal radiotherapy (3D CRT) or intensity modulated radiotherapy (IMRT) technique. Concurrent chemotherapy consisted of weekly cisplatin at a dose of 40 mg/m2. All patients were evaluated clinicoradiologically for response assessment; initially 2–3 weeks after completion of IC and then 2–3 months after completion of definitive CRT. Responses to therapy were reported according to Response Evaluation Criteria in Solid Tumors (version 1.1). Adverse events were graded according to Common Terminology Criteria for Adverse Events (CTCAE) version 4.0. Continuous variables were presented as medians and range; categorical variables were presented as counts and percentages. Failure-free survival (FFS) was taken as the primary end-point for this retrospective analysis; overall survival (OS) and toxicity profile were taken as the secondary end-points. FFS was calculated from the date of diagnosis to the date of locoregional failure, distant failure, or death from any cause, whichever occurred first; OS was calculated from the date of diagnosis until death. Kaplan–Meier method was used for estimation of survival distributions. Missing time-to-event data (due to loss to follow-up or no event observed at the time of primary analysis) were censored. All statistical analyses were performed using SPSS software version 17.0 for Windows (SPSS Inc., Chicago, IL, USA). A total 34 patients with LANPC who received IC over the mentioned time period were retrospectively reviewed. The median age at presentation was 36 years (range 18–62 years), and most of the patients were males (67.6%, n = 23). Fifteen patients (44%) had a history of tobacco use. The most common presenting symptom was neck swelling (91.2%, n = 31), followed by nasal obstruction and/or epistaxis (35.3%, n = 12). Cranial nerve palsy was present in 17.6% (n = 6) of our patients, with most common involvement of fifth cranial nerve. The median duration of symptoms before presentation was 4 months (range, 2-9 months). Histologically, 82.4% (n = 28) of our cases had WHO type 3 histology, and the remaining of the patients had WHO type 2 histology. None of our patients had WHO type 1 disease. Epstein–Barr virus (EBV) titers were not measured in our cohort and therefore could not be analyzed for its prognostic significance. The baseline patients' characteristics are depicted in [Table 1]. Nineteen (55.9%) patients received IC with doublet regimen (TP) and the remaining 15 patients received IC with triplet combination (TPF). Two patients (13.3%) in the TPF arm required dose reductions due to toxicity. The compliance of weekly cisplatin (40 mg/m2) based definitive CRT was good in both the IC arms, with >90% patients receiving at least five concurrent cycles of weekly cisplatin. The overall response rates after three cycles of TP and TPF IC were 68.4% (PR in 13 patients) and 80% (CR in 1 patient and PR in 11 patients), respectively; the corresponding rates were 84.2% (CR in 14 patients and PR in 2 patients) and 93.3% (CR in 13 patients and PR in 1 patient), respectively, 2 months after completion of CRT. None of these differences between response rates of TP and TPF arm were statistically significant (Fisher's exact test two-tailed P > 0.05). At a median follow-up of 24 months (range 2–62 months), the estimated 2-year FFS was 78.9% (n = 15) and 86.7% (n = 13) for TP and TPF arm, respectively [Figure 1]; the corresponding rates of the estimated 2-year OS were 89.5% (n = 17) and 93.3% (n = 14), respectively [Figure 2]. Again these differences between survival outcomes of TP and TPF arm were statistically nonsignificant (log-rank P > 0.05). Post-treatment relapse was seen in six patients of the whole cohort (four in TP arm and two in TPF arm). Of these six patients, two had local failure, two had distant failure (at bone), and the remaining two patients had both local and distant failure (at bone and lung). All Grade III–IV toxicities were numerically higher with triplet IC regimen in comparison to doublet regimen: hematological toxicity 33.3% (n = 5) versus 21% (n = 4); febrile neutropenia 20% (n = 3) versus 5.2% (n = 1); mucositis 13.3% (n = 2) versus 0% (n = 0), and diarrhea 13.3% (n = 2) versus 0% (n = 0). None of these differences between toxicity profile of TP and TPF arm was statistically significant (Fisher's exact test two-tailed P > 0.05). In the current retrospective analysis, we reported the results of patients with LANPC (n = 34), treated with IC (either TP or TPF) followed by definitive CRT at our center, during January 2012 to December 2017. To the best of our knowledge, this is the first ever reported data of taxane-based IC in patients with LANPC from South India, a part of the world which falls in the nonendemic zone for NPC. Till date, a majority of the published reports regarding the role of IC in LANPC came from endemic regions, where inherent biology and clinical behavior of the disease might be different from that of the nonendemic regions. As in other head–neck malignancies, there has been a renewed interest in IC for LANPC, after the introduction of taxanes. Although even in the taxane era the results of IC in LANPC from various parts of the world were mixed. The first ever encouraging phase II data were reported in 2009 by Hui et al. This randomized phase II study has found a 26% absolute improvement in 3-year OS (94% vs. 68%) with the addition of two cycles of IC with docetaxel plus cisplatin, before cisplatin-based definitive CRT. Another recently published phase III randomized study from China has found significant improvements in 3-year OS (92% vs. 86%) and distant-FFS (90% vs. 83%) in patients with LANPC, with the addition of three cycles of TPF IC before cisplatin-based definitive CRT. The IC plus CRT group in this study has significantly higher rate of Grade 3 or 4 treatment-related toxicity than CRT-alone group (73% vs. 54%, P < 0.001), but adverse events were generally manageable. A phase II randomized study from Greece reported by Fountzilas et al. has not found any significant improvement of oncological outcomes with the addition of paclitaxel plus epirubicin plus cisplatin IC to cisplatin-based concurrent CRT. Similarly, in another phase II/III study, Tan et al. from Singapore did not found any incremental gain from the addition of IC with gemcitabine plus carboplatin plus paclitaxel. The actual reasons for these mixed results regarding the impact of taxane-based IC in LANPC reported from various parts of the world are still unclear. The potential reasons may be differences in patient populations, inherent disease biology, statistical design of the studies, IC regimens used, and lack of stratification by circulating EBV DNA levels. There are real scarcity of published data from our country, regarding the use of IC in LANPC. Laskar et al. reported the outcomes of 206 patients with NPC treated at Tata Memorial Hospital, Mumbai, between 1994 and 2004. In that retrospective analysis, the majority of the patients had locally advanced disease at presentation; 28.6% patients received IC followed by definitive CRT protocol and 36.9% patients received IC followed by radiation alone. A total of 135 patients (65.5%) received some form of IC. Cisplatin was used in 93% of patients with a median dose of 120 mg/cycle in IC setting. Ifosfamide was given in addition to cisplatin in about 60% patients with a median dose of 10 g per cycle. The overall response rate of IC was 75%. The 3-year OS for the whole cohort was 82.3%. Recently, we have published outcomes of 143 patients with NPC treated at our institute between 2005 and 2011. In that retrospective analysis, the majority of patients had locally advanced disease. Cisplatin-based concurrent CRT was given to 84.7% (n = 100) of patients, whereas 15.3% (n = 18) cases received RT alone. In addition, 11% (n = 13) of patients received IC (with cisplatin plus 5-FU) in an attempt to decrease larger RT field for the locally advanced disease. At a median follow-up of 20 months, 2-year progression-free survival and OS were 67.2% and 79.5%, respectively, for the whole cohort. In the current retrospective analysis, the 2-year FFS and OS were 82.4% and 91.2%, respectively, for the whole cohort of 34 patients with LANPC. In comparison to our historical control (treated predominantly with cisplatin-based concurrent CRT), there was a significant improvement of survival outcomes with the addition of taxane-based IC to definitive CRT backbone in the current cohort (n = 34), with a manageable toxicity profile. In the current analysis, there was no significant difference between doublet (TP) and triplet (TPF) IC regimens, in terms of 2-year RFS and OS; although Grade III–IV toxicities were nonsignificantly higher with triplet IC regimen. Keeping in mind the major limitations of this study due to its retrospective nature, single-center data, and small sample size, these results need to be validated prospectively by other centers. In this study, we found a significant improvement of survival end-points with the addition of taxane-based IC to definitive CRT backbone in patients with LANPC, in comparison to our historical data. Similar survival outcomes were observed with the addition of taxane-based doublet (TP) or triplet (TPF) IC regimens before definitive CRT, with manageable toxicity. Clearly, these hypothesis-generating findings should be tested in a prospective randomized setting with adequate sample size, to decide the impact of IC and the best IC regimen in Indian patients with LANPC. Sharma TD, Singh TT, Laishram RS, Sharma LD, Sunita AK, Imchen LT. Nasopharyngeal carcinoma - A clinico-pathological study in a regional cancer centre of Northeastern India. Asian Pac J Cancer Prev 2011;12:1583-7. Lee AW, Ma BB, Ng WT, Chan AT. Management of nasopharyngeal carcinoma: Current practice and future perspective. J Clin Oncol 2015;33:3356-64. Chan AT, Gregoire V, Lefebvre JL, Licitra L, Hui EP, Leung SF, et al. Nasopharyngeal cancer: EHNS–ESMO–ESTRO Clinical Practice Guidelines for diagnosis, treatment and follow-up. Ann Oncol 2012;23:vii83-5. Lin JC, Jan JS, Hsu CY, Liang WM, Jiang RS, Wang WY. Phase III study of concurrent chemoradiotherapy versus radiotherapy alone for advanced nasopharyngeal carcinoma: Positive effect on overall and progression-free survival. J Clin Oncol 2003;21:631-7. Chan AT, Leung SF, Ngan RK, Teo PM, Lau WH, Kwan WH, et al. Overall survival after concurrent cisplatin radiotherapy compared with radiotherapy alone in locoregionally advanced nasopharyngeal carcinoma. J Natl Cancer Inst 2005;97:536-9. Wu F, Wang R, Lu H, Wei B, Feng G, Li G, et al. Concurrent chemoradiotherapy in locoregionally advanced nasopharyngeal carcinoma: Treatment outcomes of a prospective, multicentric clinical study. Radiother Oncol 2014;112:106-11. Hui EP, Ma BB, Leung SF, King AD, Mo F, Kam MK, et al. Randomized phase II trial of concurrent cisplatin-radiotherapy with or without neoadjuvant docetaxel and cisplatin in advanced nasopharyngeal carcinoma. J Clin Oncol 2009;27:242-9. Sun Y, Li WF, Chen NY, Zhang N, Hu GQ, Xie FY, et al. Induction chemotherapy plus concurrent chemoradiotherapy versus concurrent chemoradiotherapy alone in locoregionally advanced nasopharyngeal carcinoma: A phase 3, multicentre, randomised controlled trial. Lancet Oncol 2016;17:1509-20. Ribassin-Majed L, Marguet S, Lee AW, Ng WT, Ma J, Chan ATC, et al. What is the best treatment of locally advanced nasopharyngeal carcinoma? An individual patient data network meta-analysis. J Clin Oncol 2017;35:498-505. Tan TH, Soon YY, Cheo T, Tey JCS, Tham IWK. Neoadjuvant chemotherapy plus concomitant chemoradiation versus concomitant chemoradiation for locoregionally advanced nasopharyngeal carcinoma: A systematic review and meta-analysis of comparative studies. J Clin Oncol 2017;35;abstract e 17552. Altun M, Fandi A, Dupuis O, Cvitkovic E, Krajina Z, Eschwege F. Undifferentiated nasopharyngeal cancer (UCNT): Current diagnostic and therapeutic aspects. Int J Radiat Oncol Biol Phys 1995;32:859-77. Fountzilas G, Ciuleanu E, Bobos M, Kalogera-Fountzila A, Eleftheraki AG, Karayannopoulou G, et al. Induction chemotherapy followed by concomitant radiotherapy and weekly cisplatin versus the same concomitant chemoradiotherapy in patients with nasopharyngeal carcinoma: A randomized Phase II study conducted by the Hellenic Cooperative Oncology Group (HeCOG) with biomarker evaluation. Ann Oncol 2012;23:427-35. Tan T, Lim WT, Fong KW, Cheah SL, Soong YL, Ang MK, et al. Concurrent chemo-radiation with or without induction gemcitabine, Carboplatin, and Paclitaxel: A randomized, Phase 2/3 trial in locally advanced nasopharyngeal carcinoma. Int J Radiat Oncol Biol Phys 2015;91:952-60. Lo YM, Chan AT, Chan LY, Leung SF, Lam CW, Huang DP, et al. Molecular prognostication of nasopharyngeal carcinoma by quantitative analysis of circulating Epstein-Barr virus DNA. Cancer Res 2000;60:6878-81. Laskar SG, Gurram L, Gupta T, Budrukkar A, Murthy V, Agarwal JP. Outcomes in nasopharyngeal carcinoma: Results from a nonendemic cohort. Indian J Cancer 2016;53:493-8. Haleshappa RA, Thanky AH, Kuntegowdanahalli L, Kanakasetty GB, Dasappa L, Jacob L. Epidemiology and outcomes of nasopharyngeal carcinoma: Experience from a regional cancer center in Southern India. South Asian J Cancer 2017;6:122-4.